National Assembly Speaker Moon Hee-sang said Japanese Prime Minister Shinzo Abe is politicizing the “comfort women” issue as part of efforts to win supporters at home. “It is shameless. Prime Minister Abe is in a corner (in Japan), so he is politicizing the issue for domestic politics,” Moon said in an interview Friday during a US visit. “A greater politician would think about strengthening cooperation between Korea, the US and Japan ahead of the second US-North Korea summit,” Moon added. Moon’s calls for Japanese Emperor Akihito to apologize to comfort women have drawn a fierce response from Abe and Japanese Foreign Minister Taro Kono, worsening ties between the two countries. Comfort women refer to victims of Japan’s wartime sexual slavery. 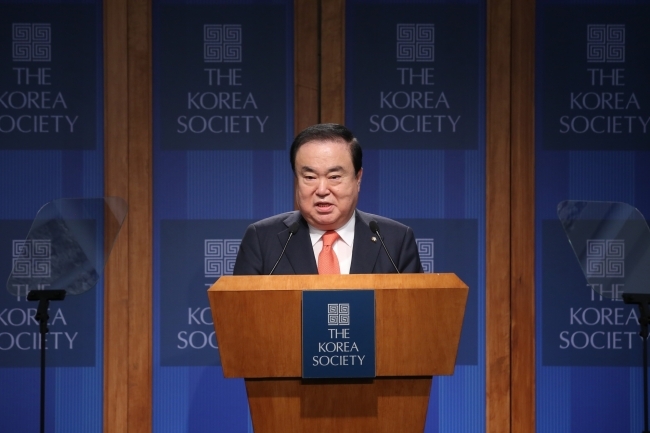 Moon said the Japanese leader has misrepresented the essence of the apology he asked for and that 10 years ago he had told the Japanese emperor to apologize to sexual slavery victims if he wishes to come to Korea. “In order for Japan to obtain the qualities of a leading state, it needs to apologize decisively, and it would be even better if it gets down on its knees,” Moon said. In response to Moon’s latest comments, Japanese Chief Cabinet Secretary Yoshihide Suga said, “I think it is very regrettable (speaker Moon) repeated the inappropriate remarks.” The Japanese government continues to push for Moon to recant his statements.